If pizza is the number one comfort food in the world then my guess is meatballs are sitting in the number two position. Meatballs are like pizza in many ways. They can be found in different countries around the world and everyone puts a different spin on them…from Swedish meatballs to the classic Italian. 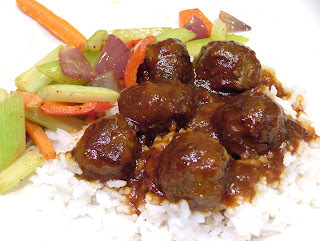 I was looking to make more of an Asian style meatball so I started with a basic meatball recipe and came up with this ginger infused rendition. My sometimes fussy eating kids gobbled them up so I’d say they turned out pretty good! As for the cooking mood in my kitchen I was movin’ to some ‘70s Motown songs while making the meatballs. The tunes had the soul of the ‘50s and ‘60s but were infused with a disco beat. The Temptations “Papa Was a Rolling Stone” and Eddie Kendricks’ “Keep on Truckin’” are a couple tunes that’ll definitely add some welcome Motown groove to any meatball cooking experience! Want to make the perfect meatballs? E-mail me and I’ll send you 5 essential meatball making tips for free. In a large bowl, using your finger tips, combine beef, breadcrumbs, onions, garlic, ginger, egg, salt, pepper and red pepper flakes. Form meat mixture into equal sized 1-inch meatballs. Heat a large non-stick skillet over medium heat. Add oil. Evenly space meatballs in the skillet. Cook until all sides of the meatballs are well browned. Remove meatballs and drain pan. Reduce heat to low and add chili sauce mixture to pan. Cook and stir until jelly is completely melted. Return meatballs to pan. Cover and simmer until meatballs are cooked through. Serve over rice or noodles.